It’s late summer at The Lexington School, no kids around to feed or watch grow, but there’s plenty of action in the school garden. Ripe tomatoes are hanging heavy on their vines, watermelons get plumper by the day, and the covered yeast is protecting its own culture to feed loaves and loaves of homemade rye and sourdough all school-year long. Not kidding about the yeast. Chef Ryan Laudenschlager and his dedicated kitchen crew now make homemade bread from homegrown yeast. In fact, they make homemade everything, and almost everything they make is fresh and locally-sourced. The first school in Fayette County to source local, fresh food for homemade school lunches, no longer do we question WHY to make fresh food for 750 children and adults each day. There is plenty of research that strongly supports fresh over processed food for healthy bodies and minds. It’s the right thing to do if you can do it. The question is HOW? How does a kitchen crew, working out of a tiny space under an extremely tight time-frame, provide from-scratch, healthy food for three hot bars, soup and potato bar, rice station, salad bar, sandwich bar, fresh cut fruit bar, whole fruit station, AND healthy on-the-go snacks for every grade three times a day? AND differentiated options for kids with food allergies? Objectively, The Lexington School’s food program is a successful paradigm for others to follow. Schools from all over visit and consult with Chef Ryan on how to improve their own food service. For six years, Chef Ryan and crew have worked hard to build a program of emulation, and the way they’ve done it is through hard work and dedication. They insist on getting it right. That means each year they tweak something, take something away, and try something new. Over six years they’ve learned what makes it work, and they are willing to share their recipe. Good Local Food Sources: We support local farms with the help of coordinator Ashton Sawyer. All pork, chicken, eggs, and beef products are local. We source fruits and veggies from a local distributor. We get local grits and rye from Weisenberger Mill, and the list really does go on. We have meals planned months in advance, so food is ordered and prep delegated. We are batch ready at any time. We keep a soup kit going every day. We bake once a week (See Ryan’s Instagram posts for 2:30 AM—that’s baking day)! We get desserts or batter done and frozen then pull the day before they are needed. Speed is key, getting stuff done. It may be easier to buy precut potatoes but it’s not what we do. We had to swallow a little pride and buy equipment like a vegetable chopper, but we are committed to fresh. We are creative with unused portions. If we have leftover broccoli, you’ll see it in the soup the next day. If we have leftover beef, it could show up as bbq, a little add-on to the hot bar. We waste as little as possible and the re-creation of something new inspires innovation the crew. For Students: We like to feed minds too. One “Food Event” each week teaches about a new ingredient, an international food, or something fun like a special dessert. 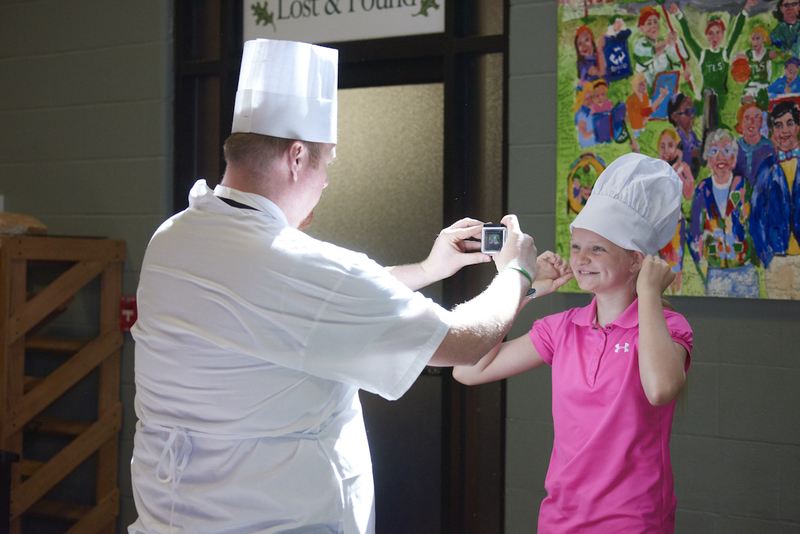 We have several students each year as “Chef for a Day.” They make the menus and help prepare the food. Teaching the kids about food they are eating is a big part of what we do each day. The kids feel a part of the process and end up buying in to the new foods we prepare them. 1. PEOPLE: James Minter sums it up: “I don’t care if you have a million dollars of equipment. If you don’t have good people, it doesn’t work.” With five Sullivan University culinary graduates among 9 total crew members, the team is efficient, communicative, creative, hard-working, and dedicated. And best of all, they love working with kids. It is a concerted effort to “help kids understand more about the world of food, how it’s made, the work it takes to make it,” and how important it is to their overall health, says Chef Ryan. We work hard to be the best even under a pretty tight schedule and space. If it weren’t for the dedication of the crew, it wouldn’t be feasible. Rather than paying more for pre-packaged, processed, quick food items, we invest our food budget in people who are talented enough to prepare fresh food. That’s the number one main ingredient in making a food program great. 9 Main Ingredients (TLS Kitchen Crew): Shannon Collins, Michelle Knickerbocker, Tracy Estepp, Ryan Laudenschlager, James Minter, Crystal Allen, Connie Haney, Dale Smith, and Diane Pardee.